Dexter and Oliver love to play in the rain which, is not much of a surprise considering they are toddler boys. Oliver wears his rain oots all over the house all the time and he is obsessed with water. 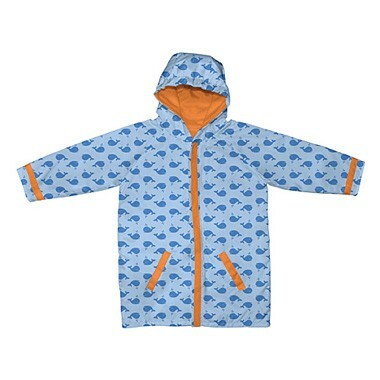 I recently received a raincoat for Oliver for review and when I first touched iplay's midweight rain coat for kids I couldn't believe how soft and supple it was. I thought for sure that it couldn't be very water repellent. Boy was I wrong! Not only are the colors bold and beautiful and the fabric soft as can be but it is PVC Free!!! How amazing is that?! The pockets are fully functional, the hood is trimmed with elastic so it contours the head and it is warm without being heavy. The only thing you should note is that this jacket runs a little on the large side. It is pretty long too. This is a great thing really because you get more bang for your buck! "Founded in 1982, i play. focuses on values that prioritize protecting our children and the Earth. Our company has always been about doing the best thing, the right thing for babies. We are committed to leadership in continually learning about product materials and potential health and safety issues concerning these materials. In 2003 we discovered the use of PVC in baby products. We researched and educated ourselves about the dangers of PVC and ensured that all of our products were PVC-free. In 2006 we learned about similar concerns over BPA, a petroleum-based hormone disrupter, and quickly eliminated it from our green sprouts® products. Now we are researching petroleum-free materials and other healthy ways to take care of babies and toddlers. Our products undergo extensive testing and conform to all US ASTM, FDA and CPSIA standards. We believe it is a company's responsibility to monitor the quality and safety of their products." The products are PVC free!!!! I like the Waterproof Insulated Bunting! and also I own some of the green sprout products and love them!! Well, they won a Cribsie award which is pretty cool, they have a store front in North Carolina, and are very conscious about the environment and children. I like their UV Sportswear! I like that they want their products to be safe and healthy for both baby and the environment. They just opened a store in Asheville! I like that iplay uses safe, non-toxic manufacturing for ALL of their products. They've won a Cribsie award! Love the UV Sports clothes!